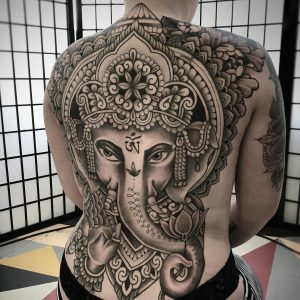 Where did your background in art and tattooing stem from? Is there one particular artist or piece of work that made you think – “this is for me”? I had always had an interest in art and tattooing, and I can remember getting the first couple of tattoos and as soon as they were finished immediately thinking ‘OK, what’s next’. 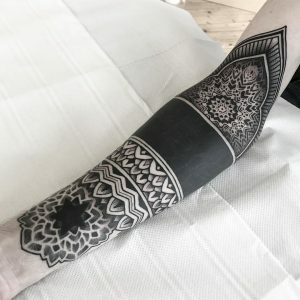 But there was actually one piece that stands out as really sparking an interest, it was a sleeve by Thomas Hooper, the picture was of it unfinished at the time but it was entitled ‘one line short of a basket’ and it was where my love of tattooing and interest in geometric and pattern work began! Your work with black ink really stands out from a lot of other practitioners of similar styles. 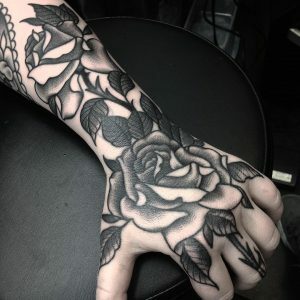 What is it about black heavy designs that make them so appealing to so many, and how did you come to employ such a signature style? I think there is a combination of things people find appealing, the ability to adapt the style I work with to be more heavy and bold or more light, more masculine or feminine, being able to fit it to each individual, their style and personality really work well. But as to how? It was a sort of slow natural progression into pattern work and then evolving it into what it is now! I think I was always interested in mandalas and geometry and as it progressed people seemed to like the mehndi and eastern patterns more so as more people booked in, I got more interested and practiced in it and then it just grew from there! 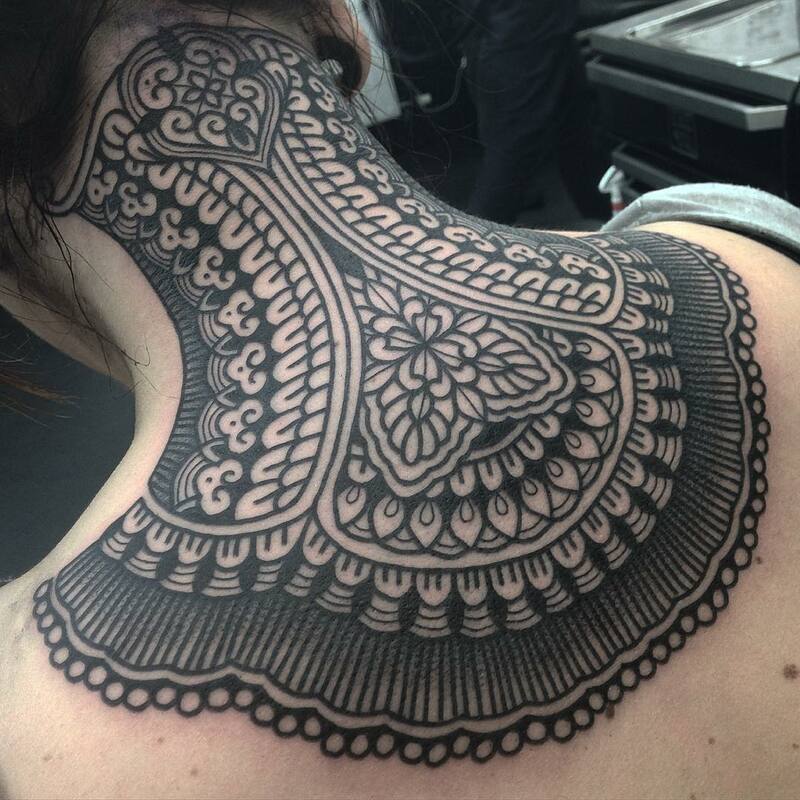 The “ornamental” tag doesn’t really do justice to the work you commit to skin. It makes sense as a descriptor but the large, intricate pieces and the small, personal designs you create are more than ornaments for the people who wear them. Even years into tattooing, do you still feel the same catharsis when you’re involved in a relationship with your client, from booking in to sitting down and working on/with them? Thank you! 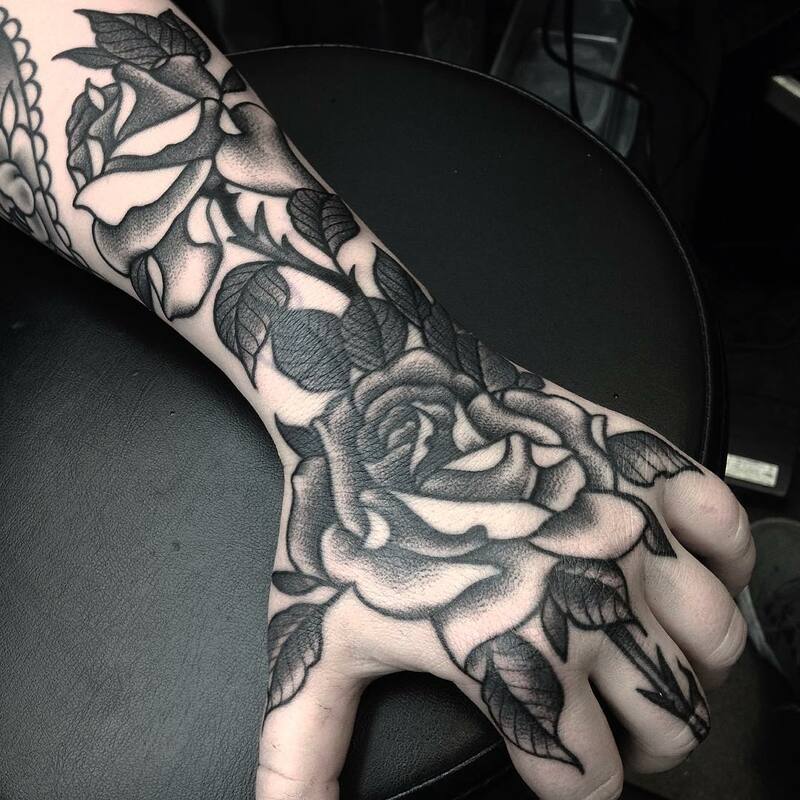 I do agree, I think ornamental is just the cleanest box to put my work in at the moment but realistically I would say all tattooing is something of an ornament, but I think having a style now that people know me for really helps to have a much better relationship between client and artist. When you start out and tattoo a little bit of everything that comes through the door it can be challenging to create pieces which are not particularly to your taste, but when you find your own particular style the trust and understanding in how the design comes together is much more free leaving me much more open to really create something new and inspiring for each individual client. At the recent Scottish Tattoo Convention, nearly every artist there had prints, flash, books and other items for sale. 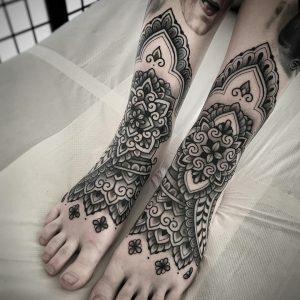 Your Gentleman’s Tattoo Flash book and the fantastic leggings you’ve created are two of the most unique “side gigs” around. 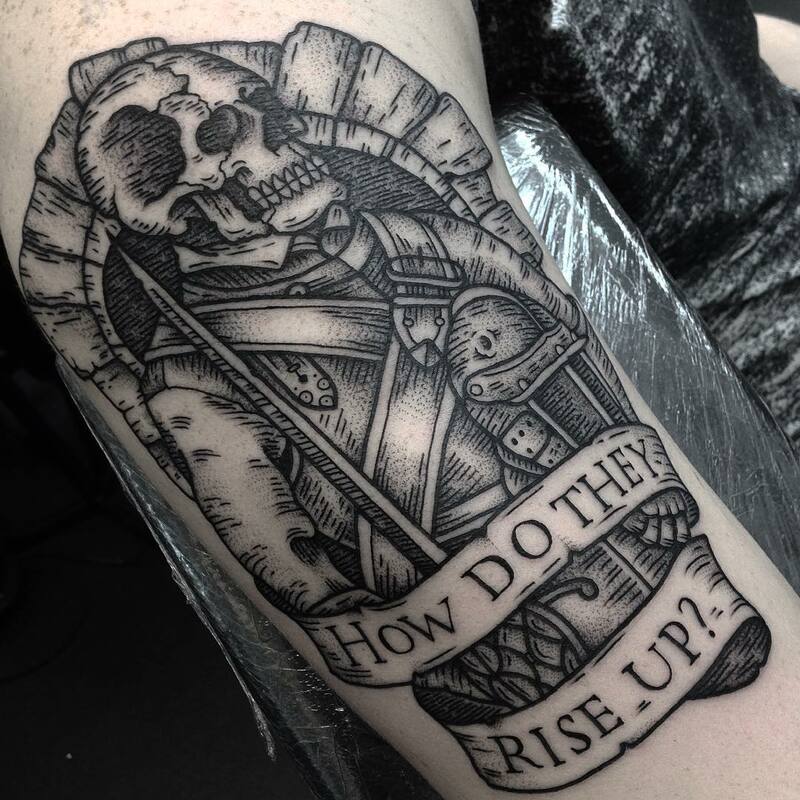 How important do you feel it is for tattoo artists to branch outside of simply just tattooing? I think its very important, both to express yourself creatively in other mediums and in business, It’s a great way to try new things! 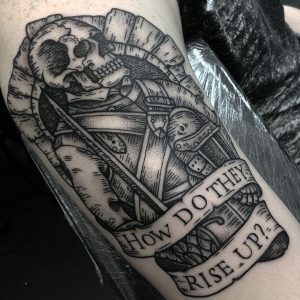 There are lots of straightforward merch ideas but I really enjoyed working with Al at Gentlemans Tattoo Flash and Jamie Christ to try and create something a bit different that no one has seen before or that hasn’t been done too much already. I have a few other projects in the works as well which has been great to get all my ideas out of my head and into reality so I can sleep at night! 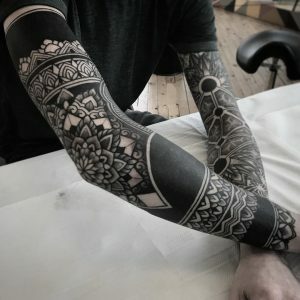 On the less creative side the extra projects are super important to make sure you have a bit of security, tattooing is one of the greatest jobs on earth but its very much self-employed and if you have an accident or get sick and can’t work, that’s when its good to know that you have other projects and another side to your business. Some might be guilty of assuming that your ornate works are all you do, but a good dig through your work brings up some stunning traditional pieces, some designs bordering on neo-trad and many in between all the usual genre tags! Are there designs, motifs or rough ideas that you have in your head that you want to tattoo, ideas that may not “seem” like a Jack Peppiette idea? At the moment not so much! 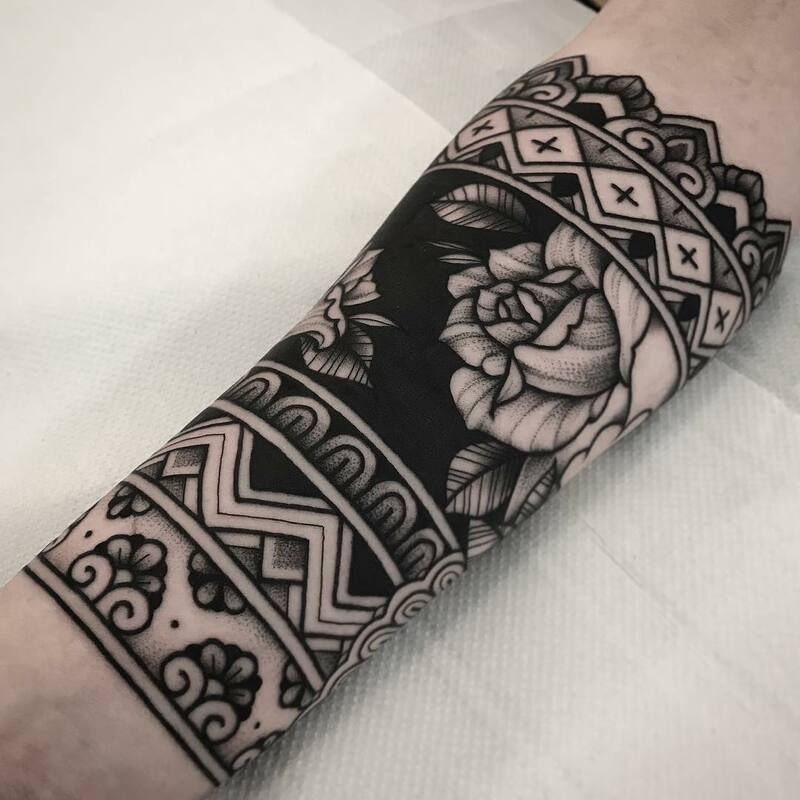 I am really enjoying experimenting with the style of tattooing I am doing at the moment and trying to do interesting and unique stuff with the motifs that come naturally to me, I really want to see how far I can take the work I am doing at the moment! 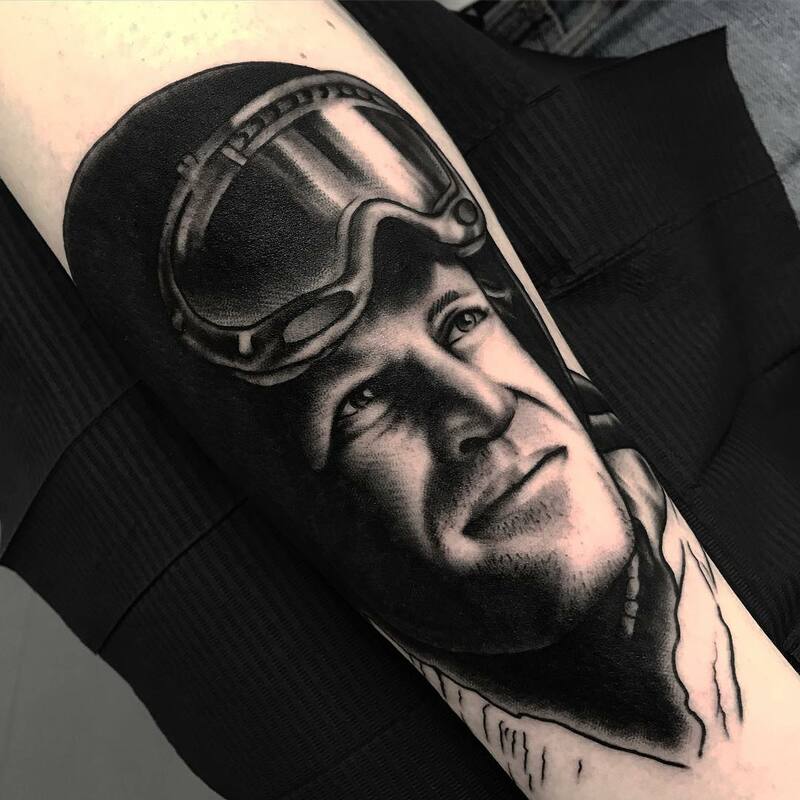 I do however still really enjoy traditional and more of a woodcut/lithograph style tattooing which is always nice to break things up a bit and keep me fresh and I also won’t say no to a good portrait or some realism now and again! I am very privileged position at the moment with some fantastic clients who allow me to create everything that goes on in my head! You quite often work on areas like the hand, throat and face with your work visible on many a scalp in the UK and plenty more worldwide. 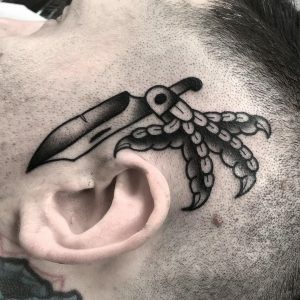 It might seem like a tired point but how do you feel about the working world, outside of tattooing, and their attitudes towards modifications that are so visible and upfront? It’s certainly an interesting point even if it comes up a fair bit, but I like the fact that everyone has different view on things. 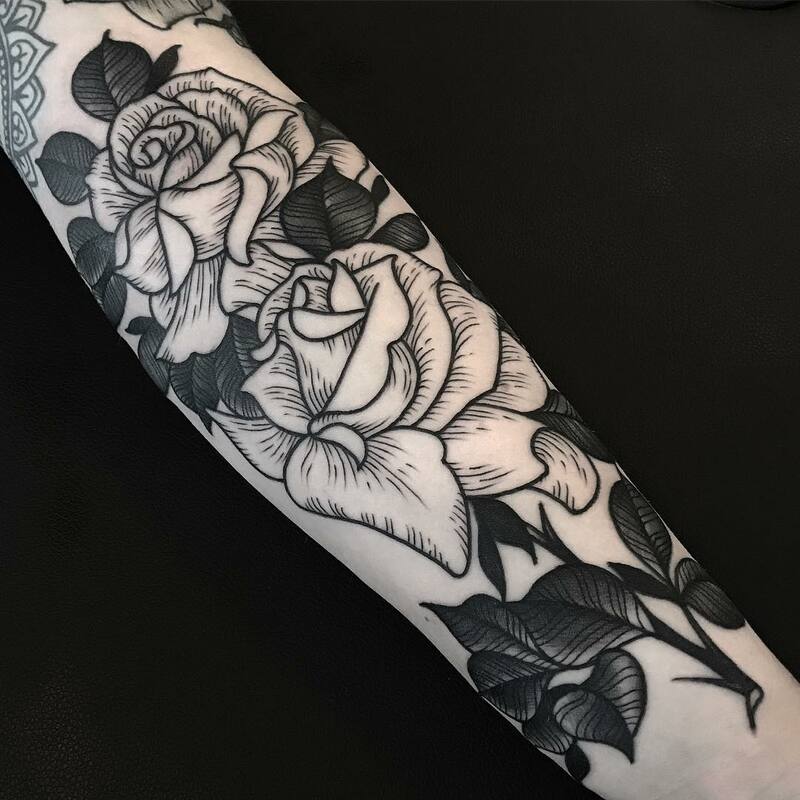 Personally, I love the fact that people trust me and like my work enough to have it become such an important part of their life and how people view them. 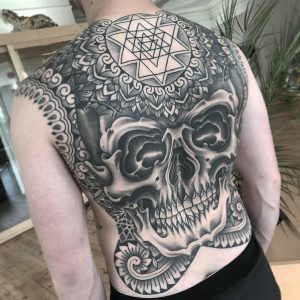 I think the attitude towards heavily tattooed people has changed a lot in just the last five years or so,it’ss so much more socially acceptable which is fantastic progress but it also leaves it more open to people being somewhat naive about the choices of who and what tattoos they choose to get on public display areas. It’s a great step forward in acceptance that its who you are rather than what you look like, but its good to be aware hands, neck and face will affect your life.